​That was the statement I made on December 3, 2015 as part of a Thoughtful Thursday (#ttvolmgrs) Twitter chat. This chat has been a (mostly) weekly event for several years, engaging leaders of volunteers throughout the world on various topics. This time, the challenge was to create a personal slogan. Now, a bit over a year after my proclamation, I’m reflecting on that statement. The world is a different place than it was then. Things seemed easier and our future brighter. There wasn’t as much fear or doubt. Now… now we have new battles, seemingly never-ending and more complex. We’re seeing causes and efforts threatened that we never thought would be in question. Many of my friends and family members are exploring ways to resist the new reality which has put loved ones and communities in danger. It’s a reality that also affects people we don’t know, yet we know that human life is valuable regardless of personal connection or “worth” as judged by societal standards. I have been listening and reading and exploring ways I can resist and contribute. This includes learning from people who have different perspectives and life experiences, volunteering, donating money, having difficult conversations, showing up at rallies and events, calling my representatives, and more. There’s always more to do. I have also decided to re-commit to my statement from 2015. 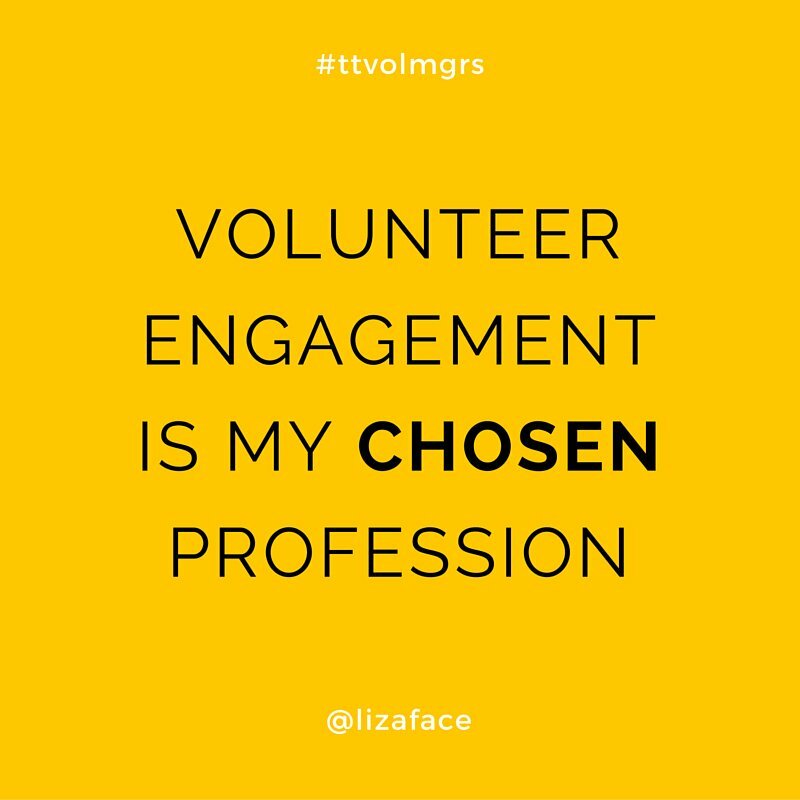 I choose Volunteer Engagement because I have seen the power of volunteering to create more connected, resilient, understanding communities. I choose this work, even when it’s difficult or boring or frustrating. (Or all three at the same time.) I choose this field because I believe my skills are useful. I commit to sharing my experiences with others, and listening to their experiences, too. I will continue learning and growing so my contributions bring value to the world.